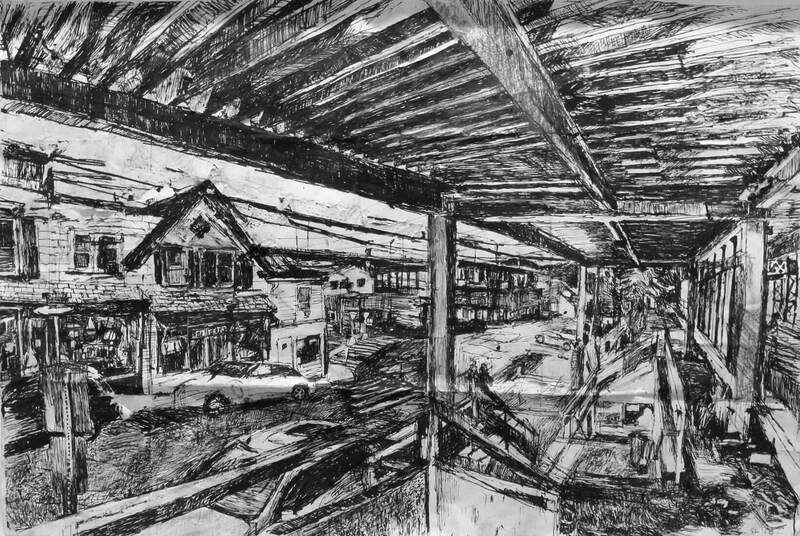 Convoluted landscapes and interiors and the threshold between them, Stanley Lewis’s carefully investigated drawings stun. The larger show at NYSS also includes several paintings that track Impressionist perceptual color-light, while tonality in Lewis’s drawings, emanating from lines that amass into textures, approaches expressionism. Lewis follows Giacometti’s emotive inroads with more pleasure than doubt, searching stabilized both by perspectival logic and moments of detail. 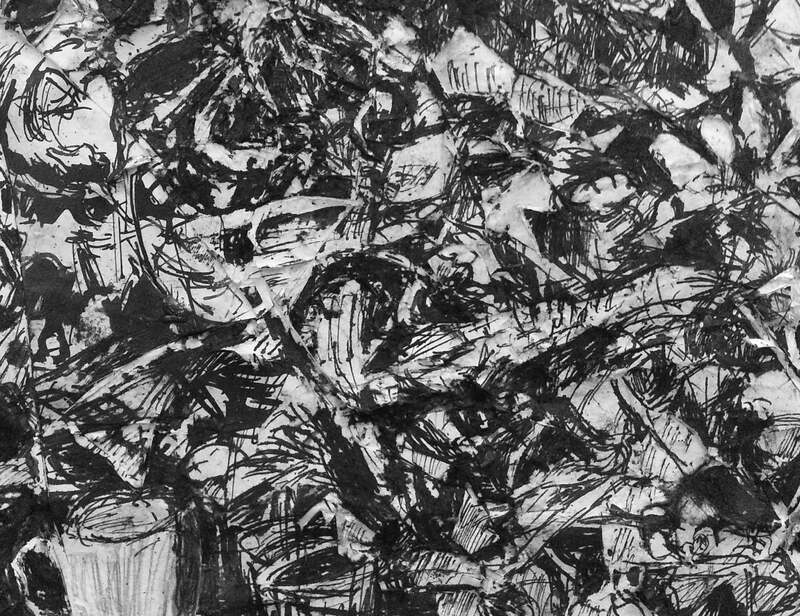 Closely viewed, vision opens toward the experiential fields of Abstract Expressionism. With an ambition to “accept everything” seen and “avoid summarizing,” 1 Lewis thwarts illustrational simplification. 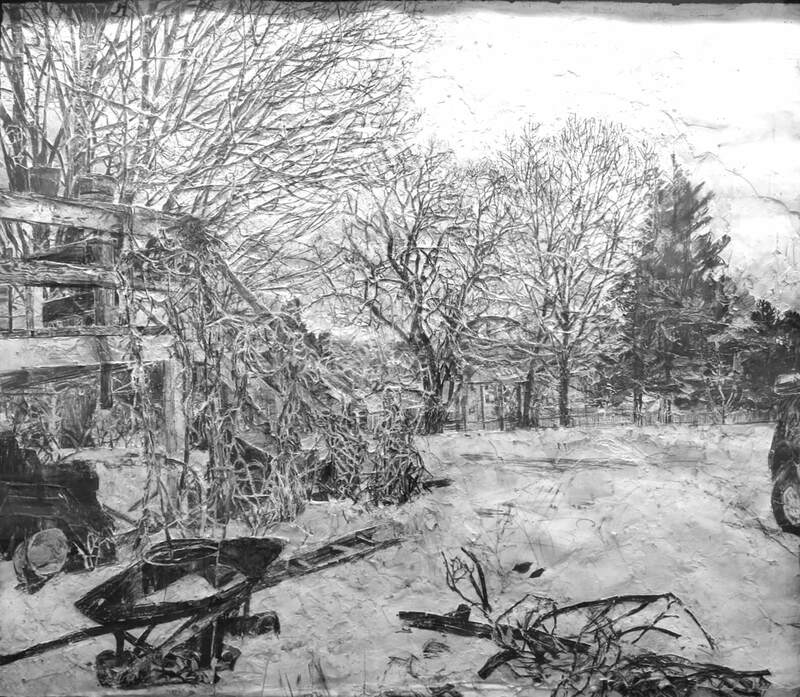 With the power of suggestion, a foreground picnic table in View of Garden from New Studio Window, Winter can extend its illusionism to a dark blotch on its left, which then reads as exposed earth. A rough central mass dominating Hemlock Tree Seen from the Upstairs Window in the Snow incorporates branches, leaves, telephone wires and snow, which adjacent tree trunks, utility pole, and a small shoveling figure then locate in space. As in most all Lewis’s work, human presence is marginalized - everything serving the artist’s (and then the viewer’s) optical bearing. Eye level, and thus position of the disembodied eye, presides. Lewis’s foregrounds often fall away, disallowing anybody’s easy entry and reinforcing flatness. Information is grounded in linear and aerial perspective schemes that rationally diminish forms in space, even as abstract pattern develops. 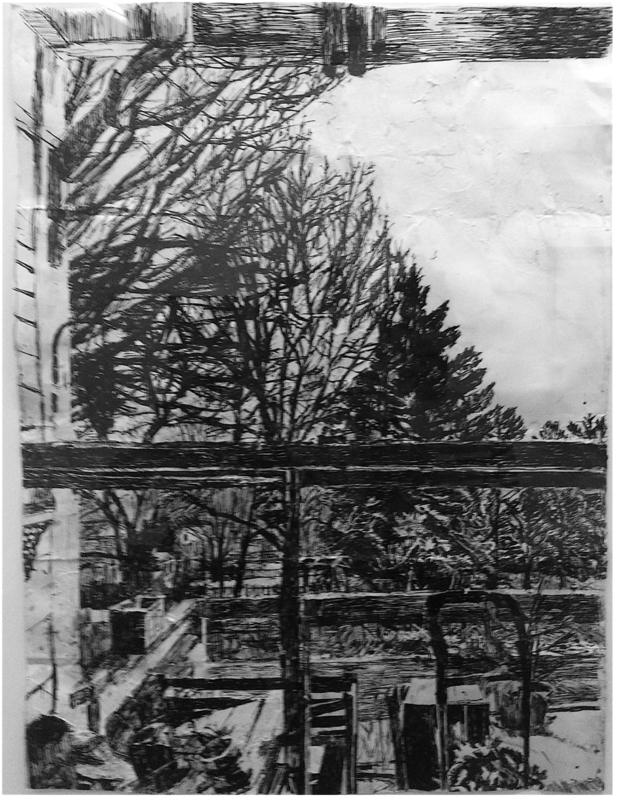 In Looking East Through Kitchen Window with Overhang, flat shapes fix - railing, sky, and trees reversing figure and ground – before atmospheric layers recede. Art historian John White would be as impressed with Lewis’s handling of the vanishing point’s picture-plane-puncturing proclivity as he was with Filippo Lippi’s. 4 Central vertical shapes prevent just that in Westport Station with Figures. 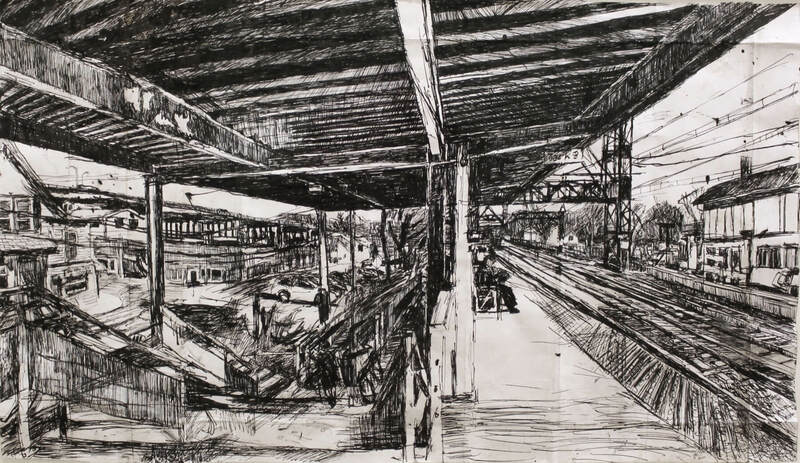 Similarly, the tunneling space on the right in Westport Train Station (at NYSS) is balanced with shapes that reiterate the format, and lateral leftward extensions both visual and actual. Extra paper is added to the format in sections as the artist’s prospect grows. The temporal play of the surveying eye becomes paramount - “The routine taking in of a subject at a glance is slowed down to follow the artist’s segment by segment recording of what meets his eye.” 5 – yet is somehow coordinated with perspective’s static station-point. 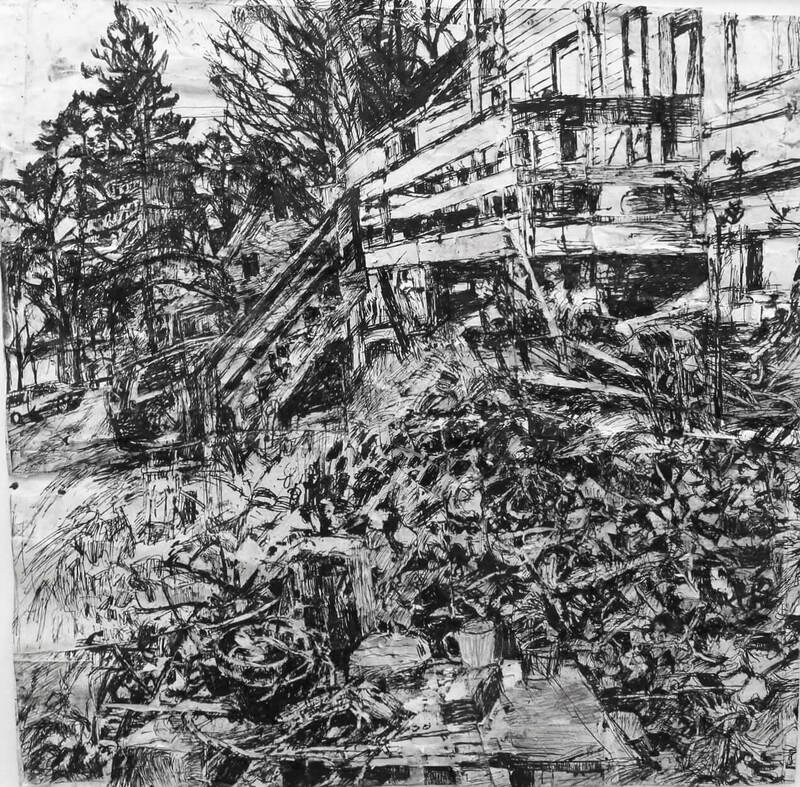 Lewis also cleverly reconciles 2-point perspective’s systematic, straight lines with the retina’s curving, multiple “snapshots” amalgamated in the brain; Looking Out Towards the Porch (with Chair) even indicates different eye levels and thus moments in time, recalling Cézanne. As one approaches Lewis’s drawings, however, illusionism disintegrates and a different vision materializes. Beyond instances of orienting taxonomy – rake, chair, cup, person, etc. – an almost non-objective terrain takes shape. Within that, Lewis’s expanding aims incorporate physical shifts from 2D to 3D. Dense bulges – layers of research – and incised hollows – corrections, revisions – create a vigorous but worn topography. Lewis cites the influence of Donatello (another Italian master of perspective) on the building of these images to almost bas-relief. Another level of inquiry here presents itself, as “it can be almost impossible to reconcile the disquieting physical disjunctions of his surfaces with his coherent, seemingly unexceptional images.” 6 The wild and uneasy peacefully correspond with the mundane. Defiling paper’s flatness and fragility might maintain momentum; says Lewis: “First I am controlled. Then fear of failure builds up. 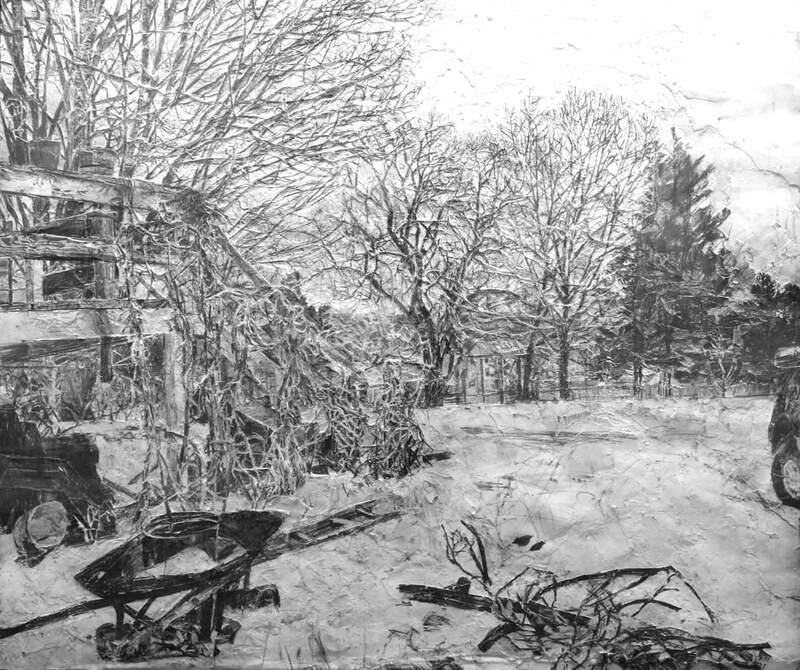 I look out at the landscape and ruin everything, Then I feel better and start over, on top of the mess I’ve made.” 7 View Toward Don Judge’s House is one such beautiful tangle. Offering the viewer such diverse encounters from different distances – lucid, perspectival realism from afar, versus a close spectacle that looks like walking through a thicket feels – is not easy. The latter’s difficult but ample realms resemble the expansive “insider” view facing an AbEx painting, and also remind of the intricate vocabularies of Chinese landscapes. 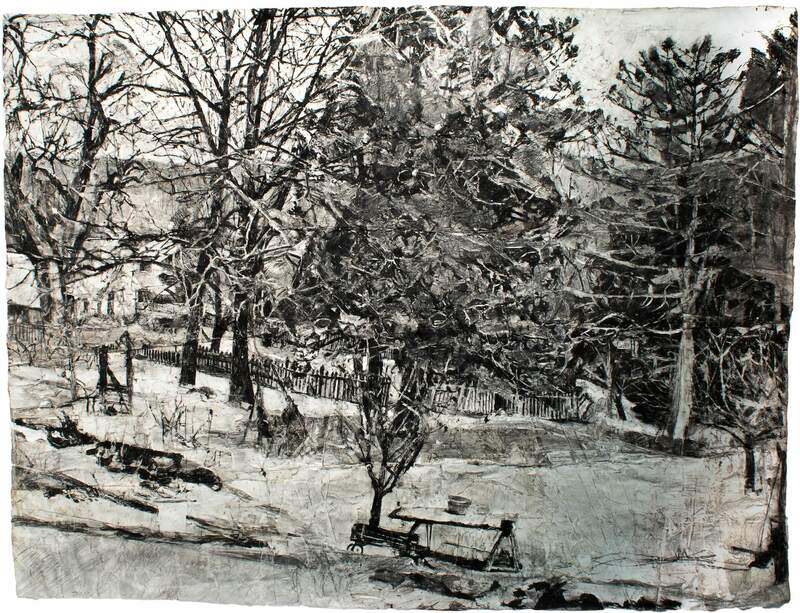 Lewis’s excellence, technical and improvisatory, makes such intimations as evocative as his work is distinctive.